EPC “Ingehim” (EPC “Inzhekhim”, as in some older unofficial documents and affiliations in scientific publications of our employees) specializes in providing engineering services for several industries (chemical, petrochemical, oil and gas refining, oil and gas), power engineering, environmental protection. Works can be carried out either singlehandedly or through bringing in contractor organizations. EPC “Ingehim” is a member of S.R.O. 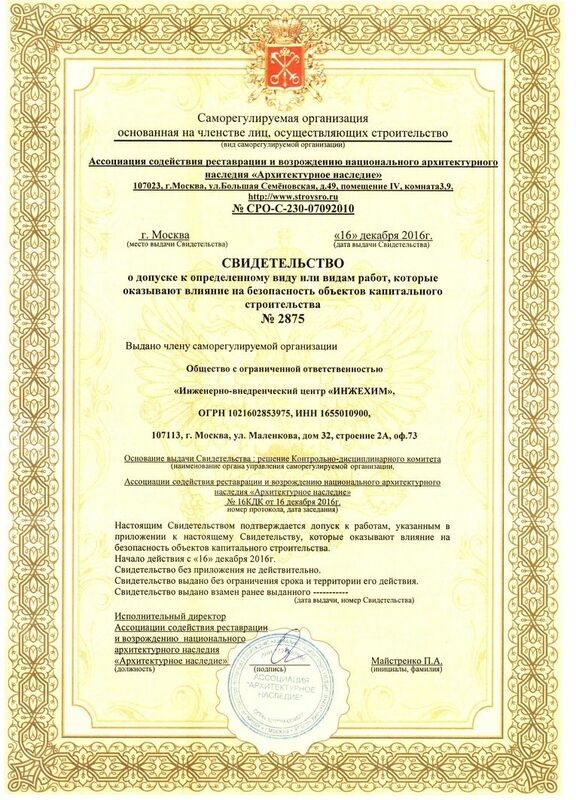 (Self-Regulatory Organization of the Russian Federation) and has permissions to perform works as prime contractor (works on organization of construction, redesigning and complete overhauling at the plants and apparatuses of the oil and gas complex). We offer a full spectrum of engineering services from feasibility study to commissioning. EPC “Ingehim” pays special attention to such service as PROJECT EXECUTION “ON TURN-KEY BASIS”. This activity of the center is supported by extensive research activity, exploring world-wide experience in the area of innovative technologies and project management mechanisms. Thus, our Customers do not need to supervise several contractors performing works under the project. They can entrust the project in reliable hands of experts of EPC “Ingehim”.